The positive characteristics of Poraver® expanded glass granules open up many possibilities for optimizing your products. With Poraver®, products become more lightweight, have a higher yield and are easier to work with. The benefits make Poraver® versatile and usable in a wide variety of areas of application. To be able to fully utilize the potential of our ecological lightweight aggregate made of recycled glass, we offer a variety of packaging and delivery options. Poraver® offers a favorable price per volume in comparison to other fillers and additives. The spherical grain allows higher packing densities and fill levels to be achieved. Poraver® makes your product lighter and this in turn reduces transport costs. With Poraver® as an aggregate, you obtain lighter products or you increase the yield of your product through a greater volume with the same weight. Achieve a lower weight per packing unit for easier and safer handling. As a result of the reduced weight of the load, load-bearing building parts can be designed with slimmer dimensions. Air is a very good insulator. Thanks to its multicellular structure, Poraver® has numerous closed cavities and therefore very good thermal insulation properties. As a recognized insulating material, Poraver® is suitable for use as fill for floors and walls. Poraver® absorbs sound and thus increases the acoustic efficacy of building materials. Very lightweight, nonflammable and stable acoustic products can be made using Poraver®. With the use of Poraver® made from recycled glass, you contribute to environmental protection because natural resources are conserved. Poraver® is nontoxic, non-reactive (inert), odor-neutral, free of harmful materials and recommended as a product that contributes to a healthy living environment. Poraver® is pure glass and therefore can be recycled. Poraver® can contribute valuable points to LEED-certified projects. Make your products LEED-compliant with Poraver®. Poraver® improves the application behavior of plaster, tile cement and mortar. The round Poraver® grains act like ball bearings. The tool noticeably glides more easily over the surface. Because of the reduced weight of dry mortar products with Poraver®, manual mixing is significantly easier. Products with a lower weight are easier to handle and transport. Panels with Poraver® can be cut and worked very easily, similar to wood. Poraver® is a high-quality product made of recycled glass and is 100 % mineral. It meets the highest quality standards with outstanding features which no other product of this variety has. Despite its low density, Poraver® is very resistant to pressure and it not only acts as a thermal insulator but also absorbs sound; it is moisture-resistant, dimensionally stable over the long term, resistant to fire and chemicals – a true all-in-one product. This unique combination of positive characteristics offers many benefits and allows Poraver® expanded glass granules to be used in many areas of application. 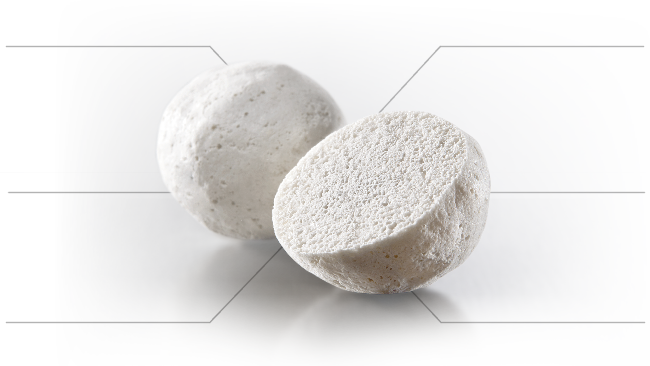 Despite the low bulk density of only 190 to 530 kg/m³, Poraver® is very resistant to pressure because of its cell geometry (depending on grain size, it has a compressive strength of 1.4 – 2.8 N/mm²). Because of the closed cell structure, a very low thermal conductivity of 0.07 W/(m·K) is achieved. The round grain shape of Poraver® ensures excellent pourability, enables easy conveying and dosing in the production process. It also facilitates mixing into formulations. Poraver® expanded glass granules absorb sound and thus increase the acoustic efficacy of building materials. Poraver® is not flammable and does not cause any harmful gases to develop during a fire. Poraver® is classified according to DIN 4102 (DIN EN 13501-1) with a class A1 fire safety rating and is suitable for use as a fire-extinguishing agent. Poraver® is pure glass, inert, non-toxic, fiber-free, solvent-free, odor-neutral, anti-allergenic as well as completely radiologically safe. The amorphous glass structure prevents the risk of silicosis. Poraver® has been stated several times as a material that poses no risks to health. Poraver® is resistant to frost, heat, decay, aging, bacteria, moisture, acids, organic solvents and does not act as a breeding ground for rodents, insects and mold. Poraver® is ideally suitable for processing with alkaline binders such as lime, cement and water glass as well as other binders. Dimensionally stable; no shrinkage, no swelling, no settling, not even after many years. Thanks to its pale granule color, Poraver® is particularly suitable for the manufacture of light-colored products, such as natural stone and marble adhesives. The use of recycled glass to manufacture Poraver® conserves natural resources and the natural environment. Poraver® is recyclable like glass and it supports sustainable construction according to LEED. Poraver® offers a number of ecological benefits.